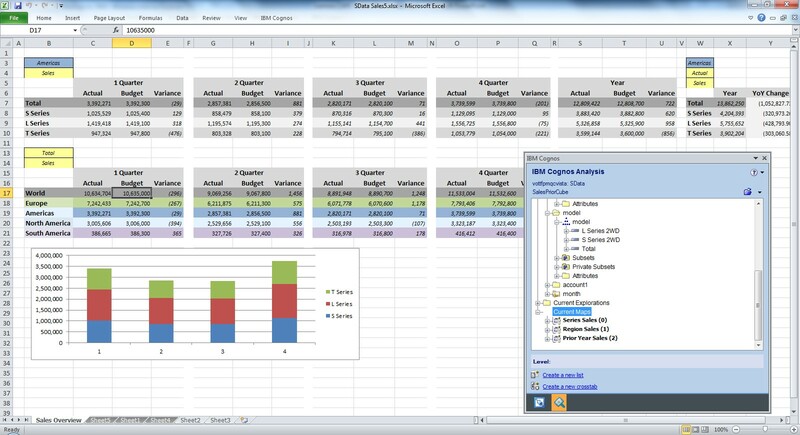 IBM Cognos TM1 is a versatile planning application owned by IBM after several acquisitions and became the flagship product (and now engine) for budgeting and planning requirements. With an in-memory modeling technology, customers are able to create multidimensional cubes with multiple hierarchies for products, customers, etc. and plan and different levels of detail. Real time calculations give the users the ability to perform what it scenarios, perform top-down or bottom-up planning to adapt the solution to many different situations and cover all the areas of the organization. Actuals can be gather from practically any source to perform analysis as well as create and distribute reports. Being able to explore the data in Excel, create reports quickly with multiple options for the users to interact with the information, create forms and visualizations, are just some of the options available to power users within this flexible solution.